I've made my love of Danguard Ace known in previous jumbo reviewsso it should come as no surprise that when I started buying Shogun die-casts, I'd also be highly interested in the ones that come from that show. 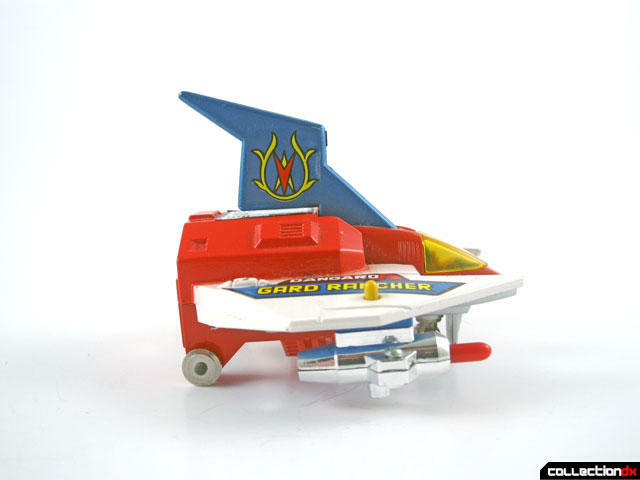 This one, the Shogun Action Vehicle Danguard Launcher, is a repackaging of the Popy PB-01 Guard Launcher. 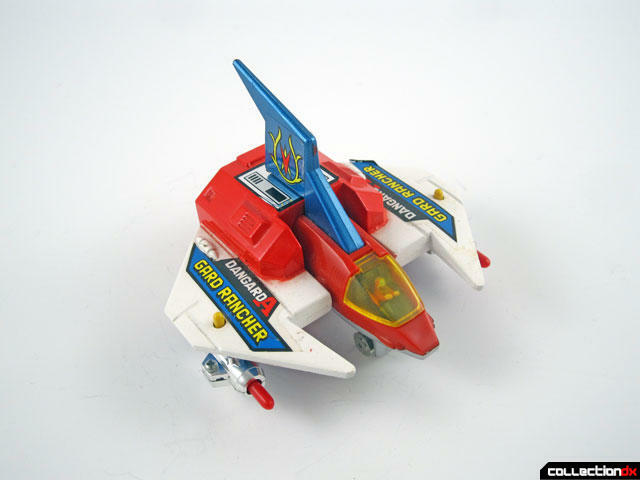 The only difference between the two is that the original Japanese one includes a small spring-loaded ramp, or launching pad, that was sadly not included here. 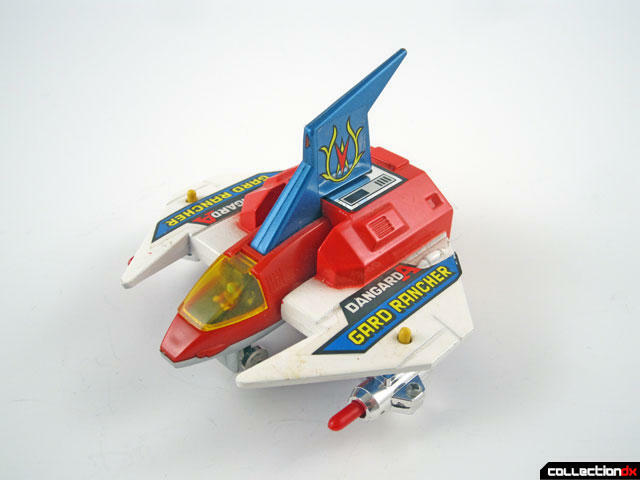 In the Danguard Ace cartoon, the main ship, the Satellizer, separates into several parts and then recombines into the Danguard Ace robot. The front of the Satellizer is the Danguard Launcher and this part forms the helmet of the robot. The toy is one of the smaller Shogun toys out there, measuring at only 2.5" tall, 3" long and 3.5" across. Fortunately, much of the body of the ship is pure die-cast. 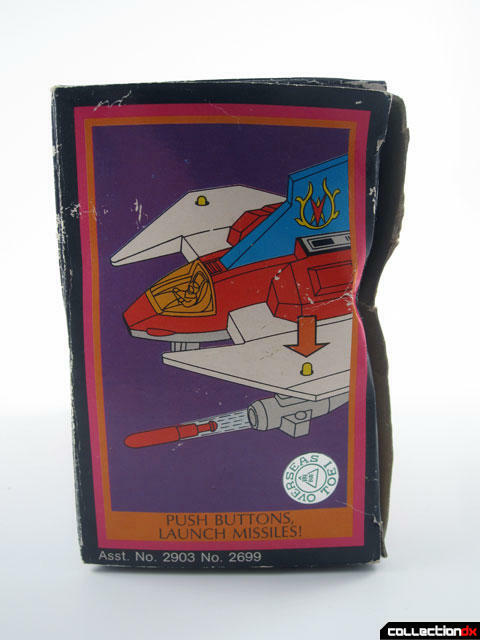 The only plastic parts are the cockpit and fin, which are all one piece, and the missile launchers underneath the wings, which fire thin red missiles when you press the little yellow button on the top.. There is also a chromed plastic piece on the underside of the back that depicts an exhaust port. 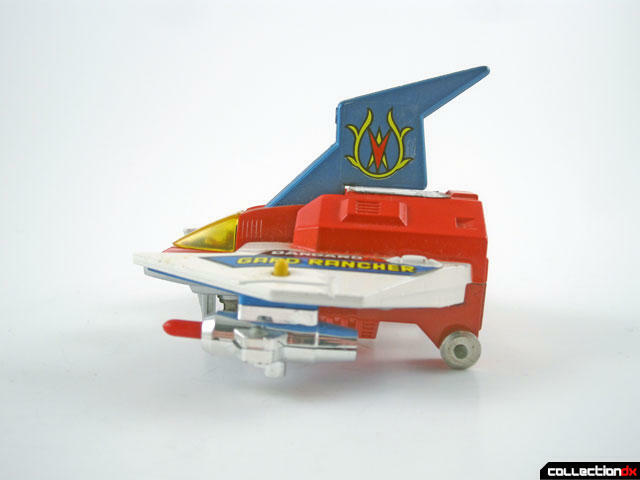 This piece can be removed and when you fold down the cockpit, you can form the helmet of Danguard Ace. I really wish there was a giant combining Danguard Ace set that was in scale with this, but alas, it was not to be. It is almost the same size as the head of the Danguard Ace jumbos from Argentina, though. Maybe if I ever came across an extra... nah. The last little play feature on this toy is nothing too exciting. 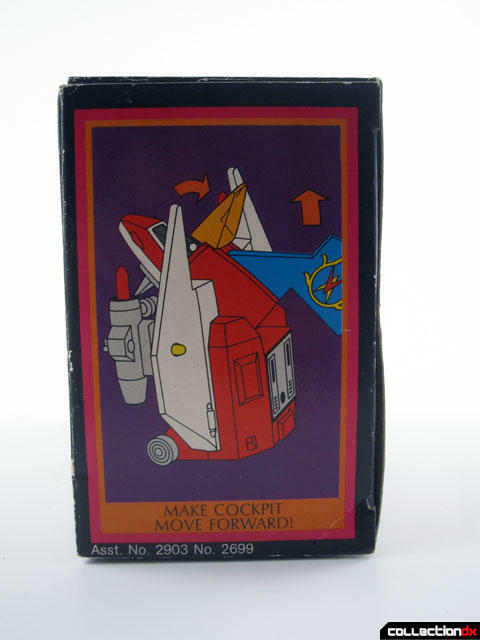 The clear plastic cockpit can be lifted up to reveal the pilot inside, but frankly, it's such a poor looking depiction of a human being that I think most would rather not bother looking at it. Lastly of course is the box. While not as glamorous and exotic looking as it's Popy counterpart, it nonetheless has the classic Shogun aesthetic that we all know and love. This example was originally sold at Mr. Big Toyland and carried a price sticker of $11.50 until being marked down to $9.88. I suspect this was probably higher than it would have cost at a typical retail store, but until I know a definite SRP for it, I'm putting $11.50 in our price field here. The sides of the box depict all the play features. And as usual, the back of the box shows other toys in the line. This time around only 6 are pictured. Jumbo head? Is it, is it?! Jumbo head? Is it, is it?! haha. So glad you touched on that question, it must come up a lot. I would indeed be a dream piece to have a giant combining gokin! Great review as always. Cool to see the Shogun Warriors lineup getting filled in with reviews. Good stuff as usual Dave. I've forgot or never knew of some of the vehicles. Love the idea of you reviewing the complete Shogun warriors line!